On the 22nd of April, Craig Williamson of Williamson’s Farm based in Gainsborough will be running the London marathon. Farmer Craig has already completed the London marathon in 2017, in a great time of 3 hours 48 minutes, however, this year he is challenging himself even more. This year, Craig is running the marathon in a hand-made tractor costume. The tractor he will be running in is a scaled down version of a Massey Ferguson 565, which is one of the first tractors his farm ever bought. 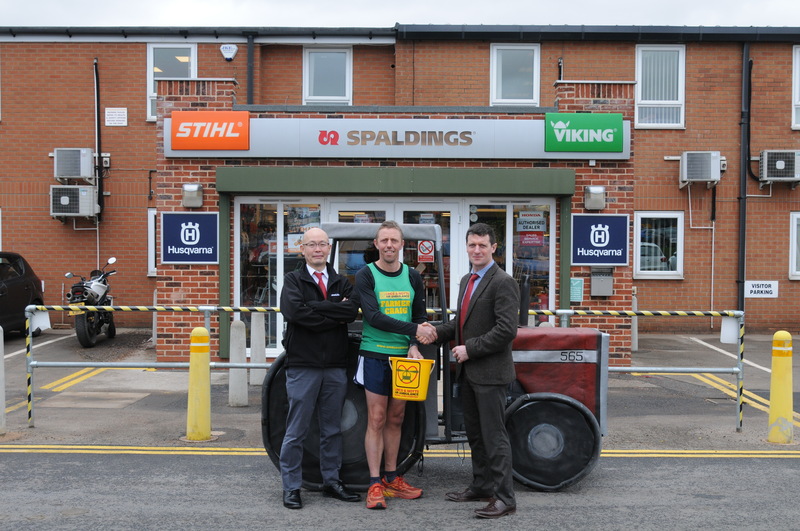 As keen supporters of the local farming sector and charitable causes, Spaldings, who are based in Lincoln, have chosen to donate £1000 to help Craig with his run. All the money raised by Craig will be donated to The Lincolnshire And Nottinghamshire Air Ambulance Charitable Trust. Spaldings are one of the UK’s leading agriculture and groundcare specialists. Since 1956, Spaldings have been supplying farmers, estates, contractors and local authorities with a comprehensive range of agriculture and groundcare products becoming Europe’s leading distributor of agricultural equipment, parts and tools. This press release was distributed by ResponseSource Press Release Wire on behalf of Drumbeat Marketing in the following categories: Sport, Media & Marketing, Farming & Animals, for more information visit https://pressreleasewire.responsesource.com/about.